As with all the projects around here, I find myself half done most of the time. 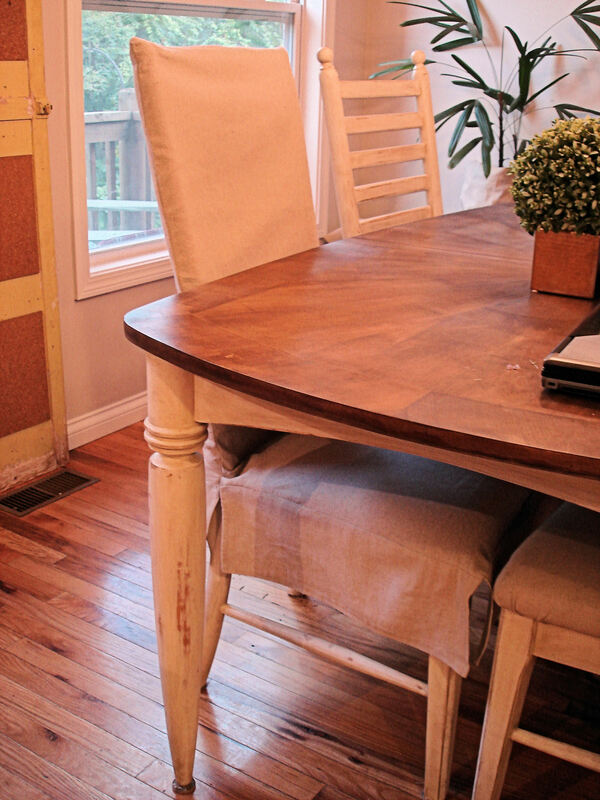 Like the fact that I have still only refinished 4 of the 8 dining room chairs in my new-ish set. 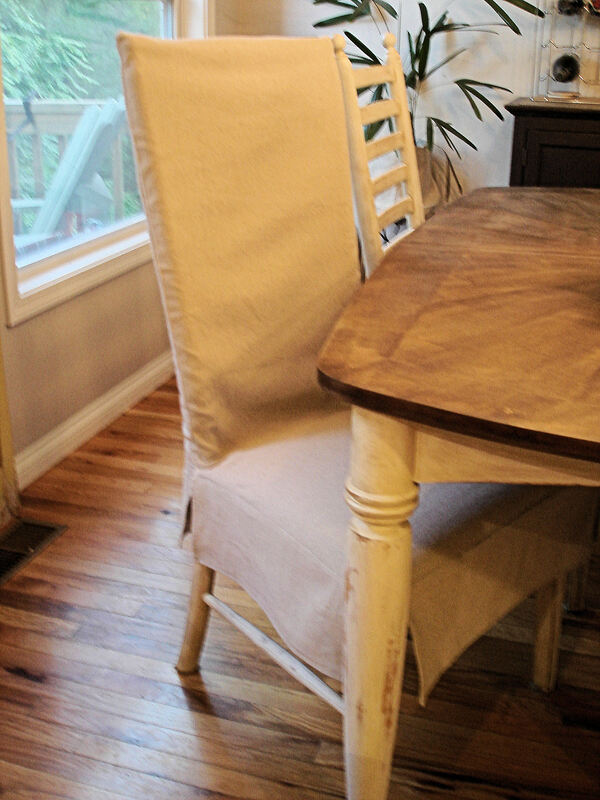 In the back of my mind, I always planned on slipcovering these chairs. I’m not a huge fan of the ladder backs or the knobs on top. But you know I’m also not a huge fan of spending money on things I could at least try to make myself. So I finally got up the nerve, grabbed my drop cloth and sewing machine and went to work. I have consulted numerous sources on the topic of slipcovering, and decided to combine several methods into one this-could-end-in-disaster method. First I tried measuring and the first piece I cut was too small. I’m still trying to figure out how that happened, although it’s entirely possible that I cannot operate a measuring tape properly. 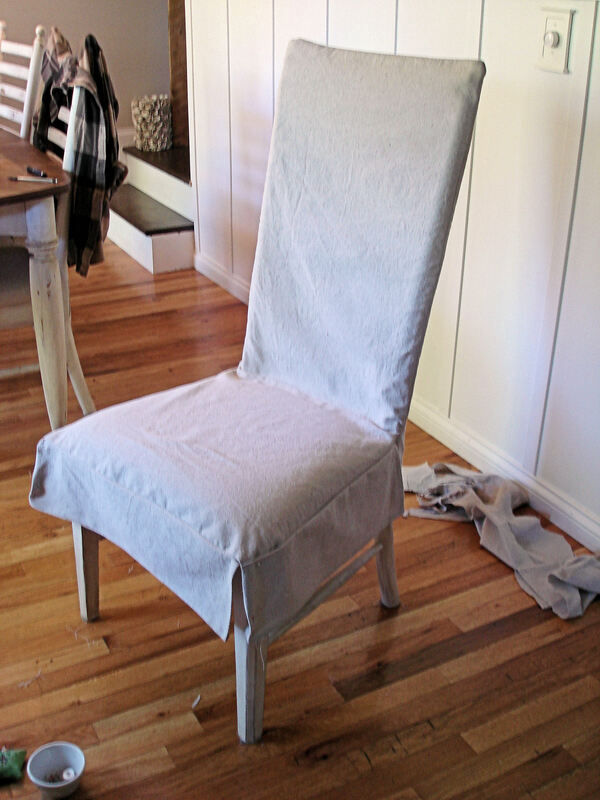 Then I resorted to just holding the fabric up to the back of the chair and marking the length and width of the ladder back. Victory! I cut out two identical pieces and sewed the top and one side seam. 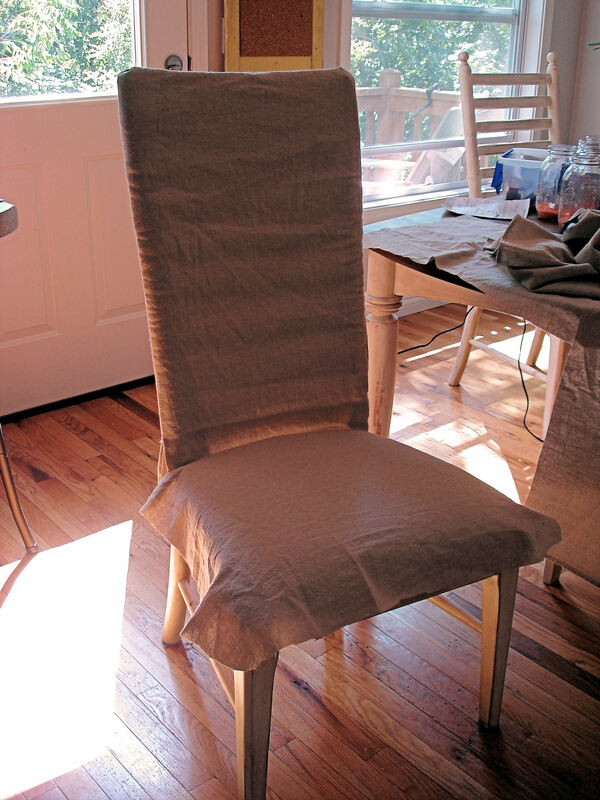 Then I slipped it on the chair (inside out) and pinned the other side. I ended up with a great fit and a modest amount of confidence. It didn’t last long though. Cue sad music. I got through the seat part of the cover without incident, but then it was time to attach some sort of flappage/trim business. I’m not going to lie to you, this was difficult. I am 99% sure I went about it the wrong way. A normal person would have cut 4 identical pieces, then pinned them. Apparently possessed by the goddess of stupidity, I cut random pieces of fabric and pinned them on the seat piece, then I tried to hem everything to the same length. Oh and yeah, it is helpful to try and save all the pre-hemmed parts of the drop cloth for this part. Note to self. When it was all said and done, I ripped out 6+ seams and spent 5 hours. TOTALLY AND COMPLETELY WORTH IT. I don’t care if it takes me a year to finish all 8 covers, I am in love with the new look. I think considering how bad my general approach was, it turned out remarkably well. Just don’t look too close. Great job !me on the other hand Im not so adventurous:/. Awesome job! You’ve inspired me!